The next category of ETFs to be covered is international equity funds, and this week’s ETF Talk concerns the second-best-performing ETF in that category during the first half of 2015, the SPDR S&P International Small Cap ETF (GWX). View the current price, volume, performance and top 10 holdings of GWX at ETFU.com. Note: the top-performing fund in this category for the first six months of 2015 will not be featured, since that ETF, iShares MSCI AC Asia ex Japan Small-Cap Fund (AXJS), no longer exists. iShares recently announced the fund’s closure along with many other funds that had generated relatively little investor interest, leading the company to return investors’ capital to them. The index underlying the GWX fund we are highlighting in this article includes small-cap stocks based in developed non-U.S. countries, weighted such that the larger-market-cap companies falling in that category are the most highly weighted. Many of these companies are not traded on U.S. exchanges. This fund did quite well in the first half of the year, posting an 11.75% gain. It holds $753 million in assets managed and also pays out a 0.43% dividend yield. It also was quite unfazed by Q2 2015, which was a weaker time for many of the funds we have examined. 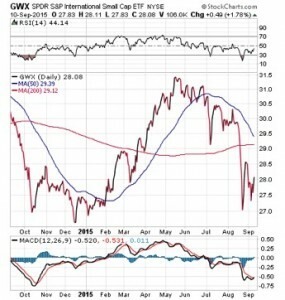 As with the rest of the market, GWX is not performing as well in recent months. When market vital signs are better than they currently are, this fund may rebound. There are many international small-cap companies to choose from, which has resulted in strong diversification for this fund. Its top 10 holdings currently are allocated only 3.25% of its assets. These holdings include Shochiku Co. Ltd., 0.38%; UNITE Group plc, 0.35%; Nippon Konpo Unyu Soko Co. Ltd., 0.34%; SimCorp A/S, 0.34%; and Wihlborgs Fastigheter AB, 0.33%. GWX’s sector distribution highlights industrials, 20.18%; financials, 20.06%; and consumer discretionary companies, 17.37%. If a recently well-performing international fund attracts your inner investor’s attention, the SPDR S&P International Small Cap ETF (GWX) could be a useful tool in your portfolio. Remember to look for the current price, volume, performance and top 10 holdings of GWX at ETFU.com. In case you missed it, I encourage you to read my e-letter column from last week about a top-performing domestic dividend-paying ETF. I also invite you to comment in the space provided below. The recent price action in many ETFs during a period of extreme market stress has prompted very real concerns for investors.